Many of the popular restaurants in Branson serve sandwich as more and more people on the go need a quick chow. Although these restaurants are offering different kinds of food specialty, many of them are still able to produce the best sandwiches in town. The top 3 sandwich restaurants in Branson that offer the best sandwich include the White River Fish House, the Panera Bread, and the Chick-fil-A Branson. The White River Fish House restaurant at Branson Landing is proud to present the most picturesque view of the pristine waters of Lake Taneycomo from floor to ceiling of the restaurant. This scenic restaurant is a floating barge serving up local favorites to fisherman and shoppers alike. Guests who are coming on the water can park their boat on the pier to stop in for a respite and enjoy a cold beverage. The restaurant was recently named the Best Restaurant in Branson by 417 Magazine and this place is unarguably features one of a kind atmosphere and outstanding service. At the White River Fish House, don’t miss to try the world famous Islamorada Fish Sandwich. You will find this sandwich so yummy. You can also try the BBQ Pulled Pork Sandwich and complete it with Fish & Chips. 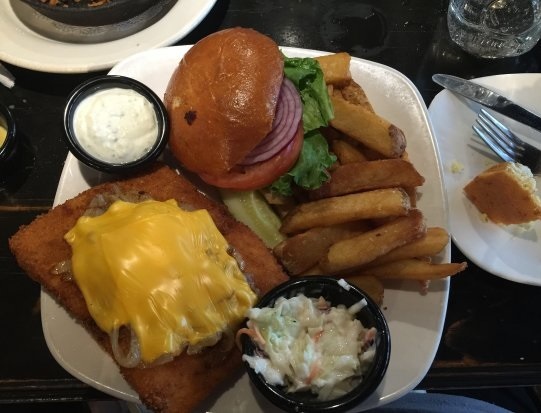 Fish sandwich is yummy too and is served in large portion. If you order fish and chips for you alone, chances are you share some of it. The restaurant serves fresh red lobster that is taken out from the water. The venison stuffed mushrooms and alligator tail are the ones not to be missed. Beautifully located in Green Mountain Drive, Panera Bread is one of a kind bread shop in Branson that serves the best bagel sandwich in town. Here you can ask them to prepare for you the best custom sandwich based on some substitutions you asked them to make. In this bread shop, don’t miss to try the Pumpkin Pie bagels, Sierra Turkey and potato soup. This place also serves the "Best mac 'n cheese on the planet!" Panera Bread was recognized as one of “100 Hot Growth Companies” by the Business Week. Panera Bread was also named as the top performer in the restaurant category by the Wall Street Journal on the Shareholder Scorecard in 2006. Chick-fil-A Branson is a fast food restaurant that also offers the best sandwich in town. One of the favorite dining destinations in Branson to enjoy great chicken and bacon sandwiches along with chicken strips, milkshakes and everything. The Original Chicken Sandwich at Chick-fil-A Branson is made available at each of Chick-fil-A’s more than 2,000 restaurants nationwide. Today, customers can enjoy Chick-fil-A’s Original Chicken Sandwich inside airports, malls, college campuses, and thousands of busy streets in 46 states. Chick-fil-A was the first restaurant to pair shopping and eating by opening its first restaurant in Atlanta-area mall. Sandwich restaurants in Branson are some of the most frequently visited dining places as they can easily serve sandwiches for people who need quick snack.